The strike undertaken by the steelworkers of Ahvaz has entered its fourth week. Reports from MEK sources inside Iran indicate that the workers remain determined to stand firm against the mullahs’ regime of oppression despite the regime’s repressive attempts to break their will and bring the strike to an end. 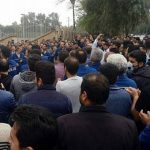 The Ahvaz steelworkers have been protesting unpaid wages and the poor working conditions inflicted on them by the regime. On Saturday, December 8th, the regime sent its representatives through the Public Relations of Ahvaz Steel Factory organization to offer false promises in an attempt to break the workers’ strike. However, the workers would not be deceived. After a hastily gathered general assembly, the striking workers decided that the regime’s words could not be trusted to carry weight. 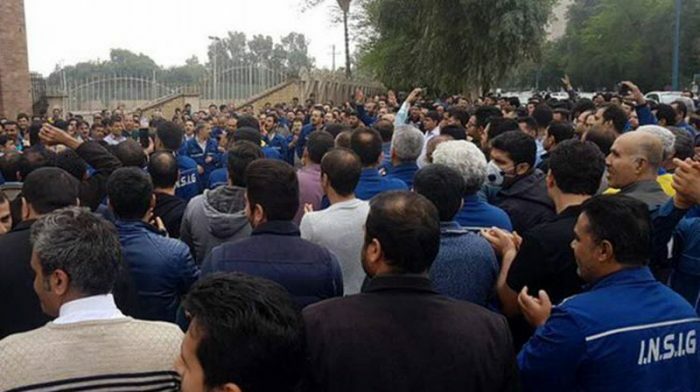 Their offered echoed the false promises made earlier in the strike by another regime-affiliated organization, the Khuzestan General Labour Office. The workers released a statement in response to the regime’s offers. They said they would continue to protest until their goals were met, including the timely payment of wages, the reestablishment of factory production lines, and the reintroduction of worker insurance. The workers would not accept anything less than the complete agreement to these demands. This prompted ire from the regime, which quickly responded by summoning a number of the workers to the regime intelligence office in Ahvaz. The Iranian opposition, the People’s Mujahedin Organisation of Iran (MEK) and the National Council of Resistance of Iran (NCRI), reported that the workers were then threatened with arrest if the strikes continued. This has been a consistent theme among recent demonstrations. Following the MEK-organised December and January nationwide uprisings, more than 8,000 protestors were arrested. Iran Human Rights Monitor reported that in regime custody, many of those detained were subject to conditions of torture and beatings. Beyond the ominous threat of arrest, there are concerns among the workers that the regime has sent mole elements into the workers’ protests movement. These moles are reportedly working to end the anti-regime protests and influence the protestors’ slogans and protest methods. The NCRI and MEK, including president-elect Maryam Rajavi, have called on the people of Iran to support the protesting steelworkers of Ahvaz. There have been several gestures of support and solidarity with the workers, including among Iranian students. Last week, students across Iran walked out of their classes and into the streets in a gesture of solidarity with their compatriots in Ahvaz. Their slogans contained messages of support.